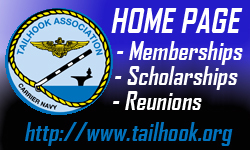 Over at the Scribe's home site, today's topic is the YF4H-1 and Operation SAGEBURNER and SKYBURNER. Presented this week: The Douglas F4D/F-6A Skyray. Another of Ed Heinemann’s now-classic designs, the F4D counted a number of firsts in its history, but like the F3H, would be victimized by the Westinghouse J-40. In its short life, the F4D (or as popularly known, “Ford”) claimed a world’s absolute speed record, the first for a carrier-based aircraft and several time-to-climb records. An interceptor by design, it served for a time with the North American Air Defense Command (NORAD) as well as equipping Marine and Reserve units. The Ford is a personal favorite of your humble scribe – be warned then that this will be an especially image-intensive article this week and as such, Flightdeck Friday will be presented in two parts. In 1947, the Navy opened competition for a delta-winged carrier-based fighter based on analysis of studies made during the war by German aeronautical engineer Dr. Alexander Lippisch. Of particular interest was the use in fast climbing interceptors. The Air Force was interested as well and Convair was busy with its interpretation which first flew in 1948 as the XF-92 and would later lead to the F-102 and F-106 (and XF2Y-1, which will be the subject of a future Flightdeck Friday). The aircraft would be powered by an afterburning version of Westinghouse’s experimental 7000 lb.s.t. Westinghouse XJ40-WE-6. Douglas was chosen over several other competitors and a contract let for a preliminary design. As it evolved from the design process, the design concept stepped away from a pure delta planform to one that featured mid-mounted, low aspect ratio swept wings with rounded tips. Wing root mounted intakes provided air for the single engine buried in the fuselage, which also provided space for additional fuel. Heinemann, all too aware of the problems with the Westinghouse engine, designed the fuselage with considerably extra room to allow the use of other engines should the J40 fail to make it to production. The wing featured leading edge slats and elevons. Armament included 4 x 20mm cannon. 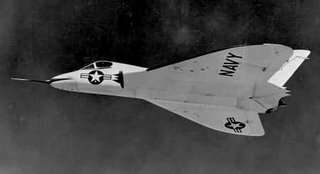 Pleased with what they saw, the Navy awarded a contract for 2 prototypes, to be called the XF4D-1 Skyray, in late 1948. The airframe was completed two years later, but the engine had experienced development delays and was late. 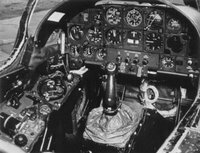 In its place,Douglas installed the Allison J35-A-17 (rated at 5Klb thrust). First flight was January 1951 and an order for an initial batch of 12 aircraft followed in Feb 1951. Although seriously underpowered with the J35, the F4D nevertheless demonstrated admirable flight characteristics and when a non-afterburning version of the XJ40 finally hit the street, it was installed in the “Ford”. With the upgrade, the XF4D finally was able to fly faster than the speed of sound. In 1952 a production order was let for 230 F4D-1s and in 1953, an afterburner version of the J40 (XJ40-WE-8) was finally available and back fitted to the prototypes. With this version of the J40, the F4D could exceed the speed of sound in level flight, a first for carrier-based fighter. Now the full range of the aircraft’s performance envelope could be explored, beginning with a closed course absolute speed record of 752.944 mph, a first for a carrier-based a/c. Later that year, a 100-km record was set @ 728.11 mph. 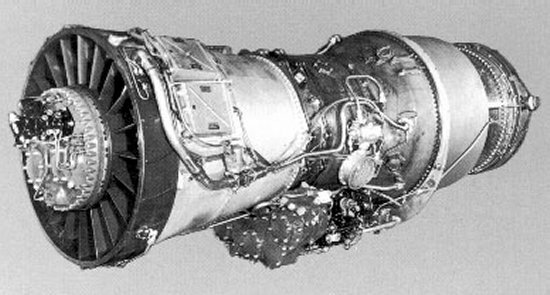 As the problems with the J40 continued to manifest themselves, the Navy looked to alternate power plants and ended up selecting the Pratt & Whitney J57. Larger and heavier than the J40, adapting the J57 to the F4D would require extensive modifications to the airframe to adapt it. 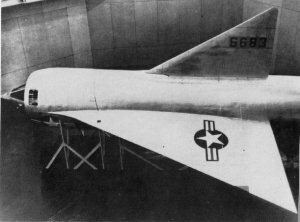 The first production F4D-1 incorporating the redesign for the J57 first flew in June 1954. Some problems with engine stalls at high altitude were encountered in flight testing which led to redesigned intakes. With all the delays due to airframe redesign and subsequent fixes from tests, the first Skyray did not reach fleet units until 1956. 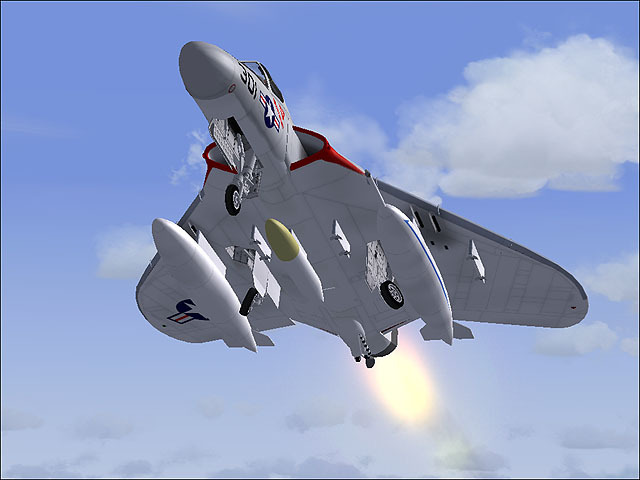 VC-3 was the first to receive the F4D-1 and performed the service evaluation. 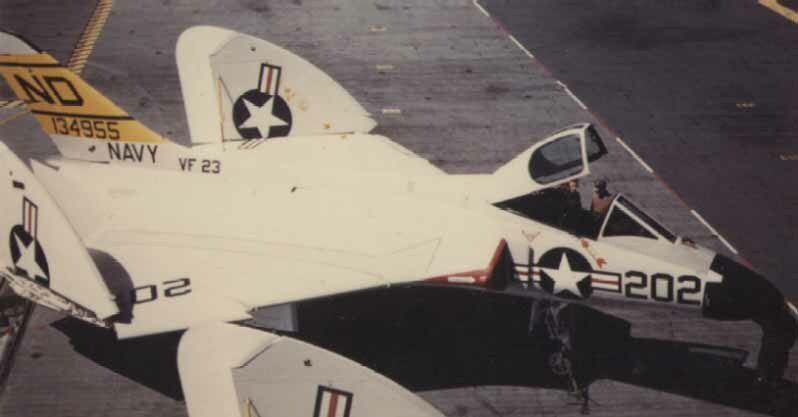 The Be-Devilers of VF-74 were the first operational fleet unit to be outfitted with the F4D-1, replacing the F9F Cougars the squadron had just received 18 months previously. 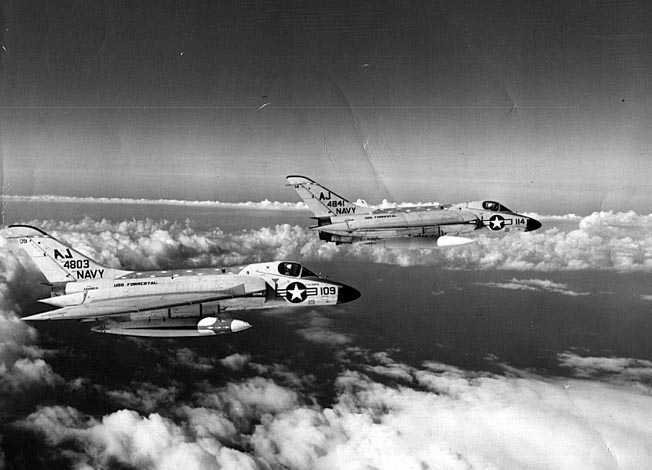 VF-74 made three deployments to the Med, twice aboard USS Intrepid (CVA-11). 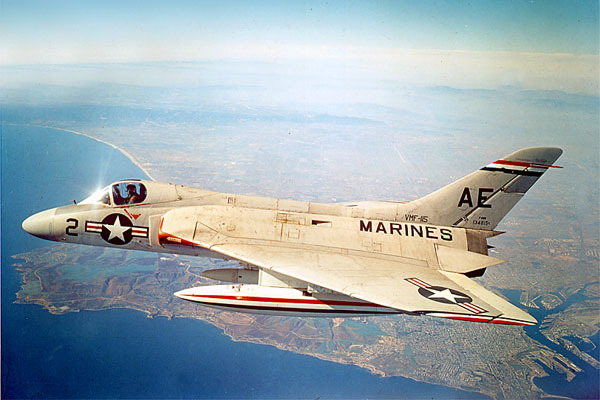 VMF-115 was the first Marine squadron to receive the F4D-1 in 1957. Other squadrons that flew the Ford were VFAW-3 (formerly VC-3), VF-13, VF-23, VF-51, VF-101, VF-102, VF-141, VF-162, VF-213, VF-881, and VF-882 for the Navy, and VMF-113, VMF-114, VMF-215, VMF-314, VMF-513, VMF-531 and VMF-542 for the Marines. Configured for the intercept mission, the F4D-1 was equipped with the AN/APQ-50A search/single-track radar which was tied into the Aero 13F fire control system. Underwing stores included 2.75” rocket pods, 2,000lb bombs, AIM-9 Sidewinder IR missiles and/or 300 gal drop tanks and a centerline electronics pod. By most accounts the Ford was something of a handful to fly. Even with the J57, it was still a heavy aircraft and somewhat underpowered (as were most jets of that day). 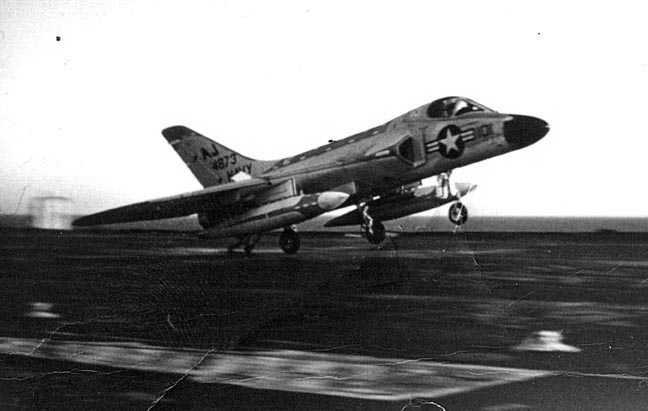 Speculation in some quarters were that it suffered from a flight condition more frequently seen in the Air Force’s F-100 Super Sabre known as the "Saber Dance" where there is sufficient trust (at almost vertical aircraft attitude) to keep the aircraft up, but insufficient airspeed to control it. At the high α required in the CV-landing environment, this would be problematic at best. Still, in spite of the above, the Ford was a noteworthy performer, especially when compared to the other carrier aircraft in the contemporary inventory. It was legendary for its climbing ability in burner, as attested to in May 1958 when Maj Ed LeFaivre set 5 time to altitude records (3000 meters (9842.5 feet) in 44.39 seconds, 6000 meters (19,685 feet) in 1 min 6.13 seconds, 9000 meters (29,527.5 feet) in 1 minute 29.81 seconds, 12,000 meters (39,370 feet) in 1 minute 51.23 seconds, and 15,000 meters (49,212.5 feet) in 2 minutes 36.05 seconds).